T and I had a list of “bucket list” trips to take while we are in South America. The three I had on my list were Easter Island, the Galapagos Islands, and Macchu Picchu. I quickly found out for the latter two that it is far more economical and quicker to go from the US (even Newark!) to those two places in South America than from our corner of rural Argentina. (Go figure!) Because I had no urge to spend thirty hours straight travelling and still be on the same continent… we decided to go to Easter Island in October 2015. Ultimately we ended up staying six days calendar-wise, but closer to four if you exclude the travel days. In summary: we felt we stayed about a day too long. Three days is great to get the best out of the island. From Argentina, it’s a pretty straight shot to Santiago. We took the 1.5 hour flight from Posadas to Buenos Aires, switched airports, and then had another 1.5 hour flight from Buenos Aires to Santiago. To break up the travel a little, we spent a few days in Santiago, and then continued on to Easter Island. Since Easter Island is a highly protected space, there are only a few flights in and out each day. We chose the LAN flight from Santiago, which was around 5.5 hours each way. It may still be Chilean territory, but it is definitely far out in the Pacific! The flight wasn’t cheap, but we didn’t think it was overtly expensive. The plane we flew in was brand new, with the best in-flight entertainment I’ve seen in my travels and excellent food choices. We even got real forks and knives! Did I mention it’s a small airport? Seriously, the baggage carousel was tiny (and pretty much a dude with a cart), and it was probably only about 200 steps from the entrance to the exit. Most times, your hotel will have arranged some variety of transport for you. Unless you’re going for a full VIP experience, it will be in a bigger (10 passenger) van with some other travelers. We got some complimentary lei from our van driver to welcome us to the island–starting the island vibe from the start. Hotels are expensive on the island. There’s no way around it. With only one town on the whole 12-mile-long island (Hanga Roa), there’s not a lot in the way of choices or trying to stay “outside the city” to ease up on costs. We decided to bite the bullet and stay in a cabana at the Taha Tai Hotel. The WiFi is only available in the main lobby and in the business center (when it’s open). But–you’re on vacation in a UNESCO heritage site–so who needs Netflix! The cabanas don’t actually have ocean views, unlike what the website photos seem to suggest. In fact, the ocean views are at the hotel’s restaurant. The hot water comes from solar heaters. We learned the hard way that if you go in the cooler seasons, and it’s cloudy for a few days, you’ll find you don’t have any hot water anymore. Again, eco-conscious island and world heritage site. Overall, though, it was a good choice. Our room had plenty of space, a really nice little deck with chairs, and the staff were all pleasant. The hotel is right near town, so every day we could easily walk from our room to right to the middle of the “action” without any great amount of exertion. If you’re staying near town and have booked your tours through a touring company, it’s entirely plausible that all other transit needs can be taken care of with your own two feet. It’s a small island. 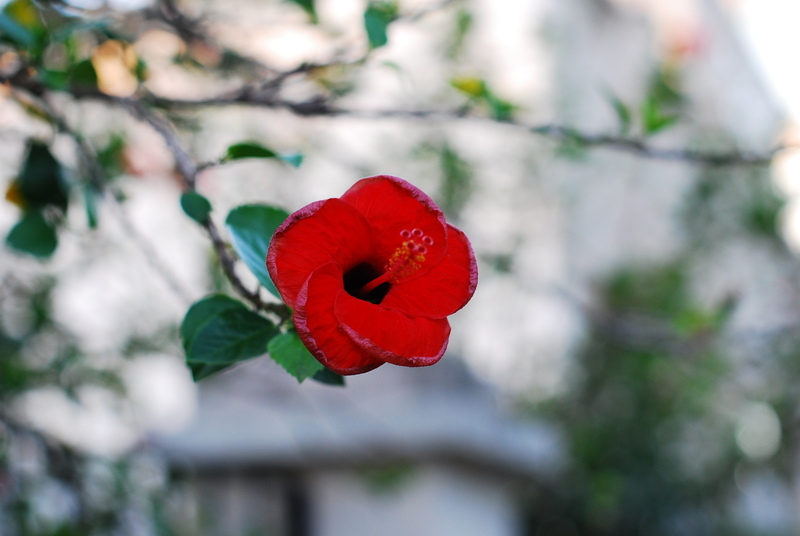 However, we’re a little more wanderlust-y and wanted a way to explore on our own in addition to the guided tours. We rented a four wheeler (street legal on the island) for the duration of our trip, and found it to be a great method of exploring sites further we had only seen for a short while on the guided tours. For instance, we spent a solid half a day at the beautiful Anakena Beach on the opposite side of the island. We would have never been able to do that without the four wheeler. Let’s be clear–Easter Island is a “bucket list” place through and through–plus, tourism is pretty much the only thing spurring the economy of this tiny island. Thus, things are expensive–much more so than mainland Chile. I’m sure there are ways to be super-frugal about food and experiences, but T and I decided that since the chances of us going back to Easter Island were slim, we’d enjoy it while we were there and not try to cheap out. Was it more expensive than the rest of our vacation (and probably the priciest vacation we’ll go on down here)? Sure–but it was totally worth it. It’s cooler than you think–especially with the sea breezes .Bring a jacket–even if you’re bringing your swimsuit too. There were days where we started the day swimming and ended the day bundled up and cold. Also, bring incredibly comfortable shoes (sneakers are recommended). There’s a lot of walking. I’ll go into specific restaurants in another post–but get ready for a lot of fish. It seems like it should go without saying for an island in the middle of the Pacific–but fish is a huge part of the Polynesian diet. If you don’t like fish, your menu choices may be more limited–but they do have beef, pork, etc. available everywhere. My fish-averse husband didn’t seem to have any problems. We booked all of our tours through Viator, which has been our consistent go-to for finding fun activities in places near and far. They partnered with a local tour group that ran three different tours in a single package (two half-day tours and one full-day tour). We found the half-day tours to be just right in length to avoid “Moai Overload.” The full-day was a little much. Regardless, we had a good experience, and the guides had excellent English speaking skills and were well-organized. If you do have a tour guide, you might be able to get a discount on the park admission. It’s kind of a fuzzy gray moral area, but there are discounts for Chileans, and an even bigger discount for Rapa Nui (indigenous to the island), so if your (often Rapa Nui) guide allows it, they might drive to the park service ticket counter and buy your ticket for you at a discount. Again, it’s kind of a gray moral area, but it’s a way to get it done. Most guides will help you out with getting park tickets if you managed to miss it on the way in. Over the next week or so, I’ll be writing up posts about different parts of the island we explored and our thoughts. Get ready for some stunning photos. I’m back! I know, it’s been months since I last posted. Sorry about that. What have I been doing in the meantime? I applied to business school, got in (hooray! ), attended a bachelorette party in the States (in the fancy-schmancy Hamptons), attended two weddings in the US, finished up a brutal statistics class, and went to an even more exhausting week of business school orientation/classes. Phew! I’m going to try to schedule out posts more regularly from now on. T and I are on the downward hill now for our Argentinian adventure–a year and a half done, a year and a half to go! It’s very odd to start thinking about packing up our stuff already and considering how we’ll start getting ready to go back to the US. 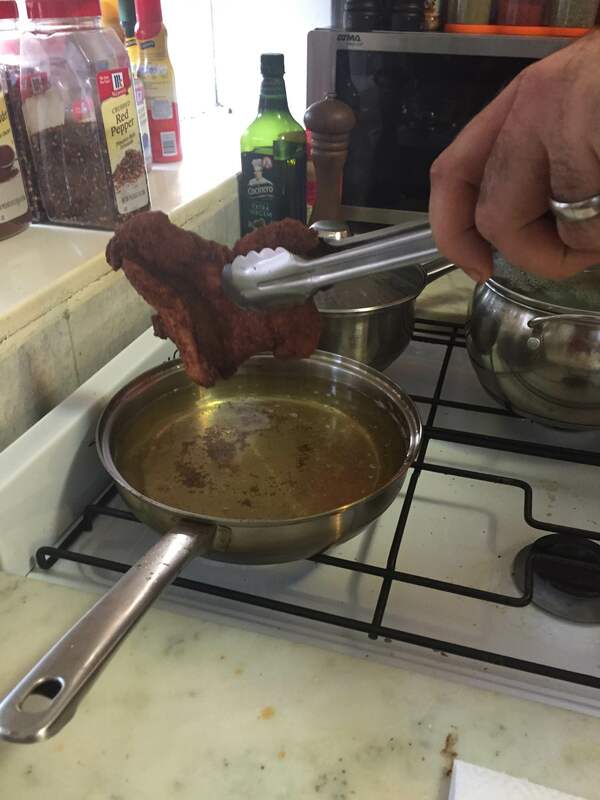 I’d like to start sharing some of the recipes that we’ve discovered here in Argentina. I’ve invested in some Argentinian cookbooks (with another post on those later), and our friends down here are very excited for us to try all sorts of recipes. You’ve heard lots about the famous asados in Argentina, but today let’s start with some quintessential lunch food down here–the milanesa de pollo. 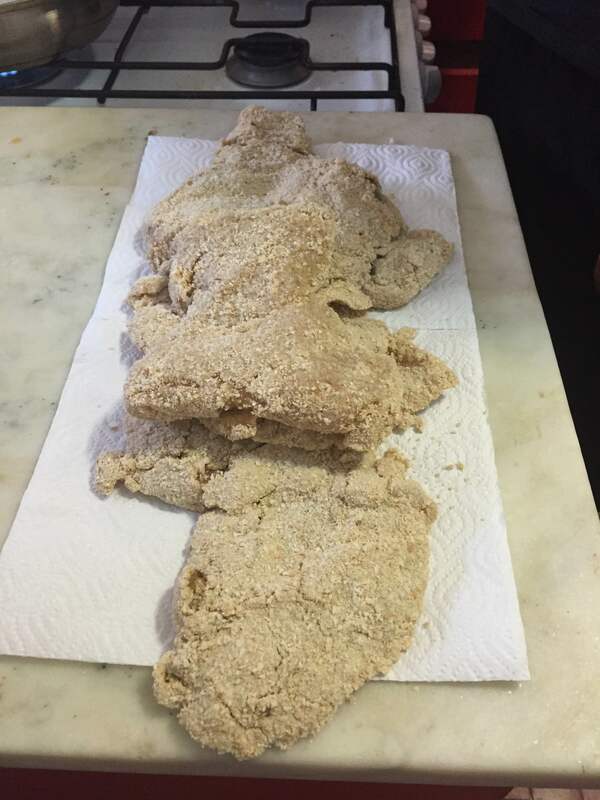 Essentially a piece of chicken (or, in other cases, beef) that is pounded flat and covered in bread crumbs and spices, the milanesa, either on its own or in sandwich form, is something you’ll see on every Argentinian menu. They’re cheap, filling, and easy to customize. You can have a milanesa napolitana with tomatoes and cheese on top, you can have one with fried eggs–you can pretty much add whatever you’d like to your milanesa to make it yours. 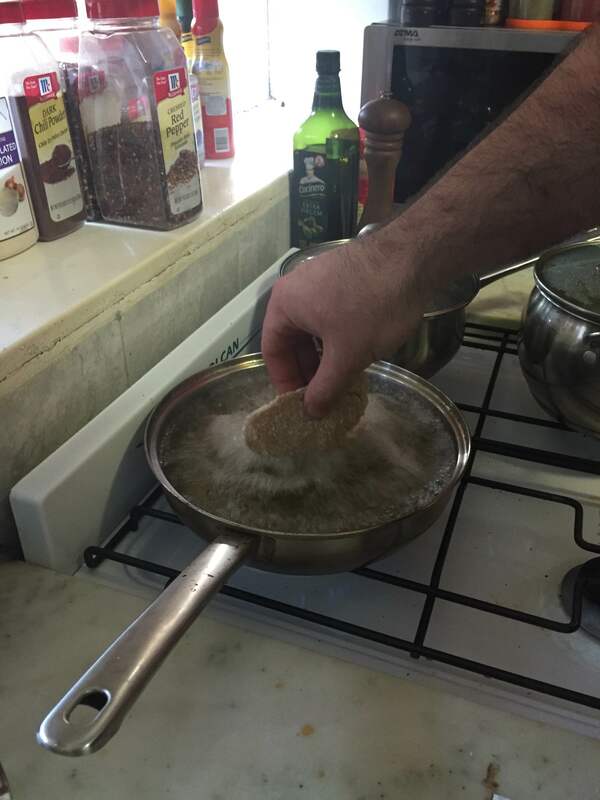 It’s easy to cook milanesas at home as well. We tend to buy ours pre-beaten and pre-breaded from our local supermercado, but just buy a few chicken breasts and a mallet to pound yours to the correct, thin consistency. Then cover in egg and dip into the breadcrumb/spice mixture. 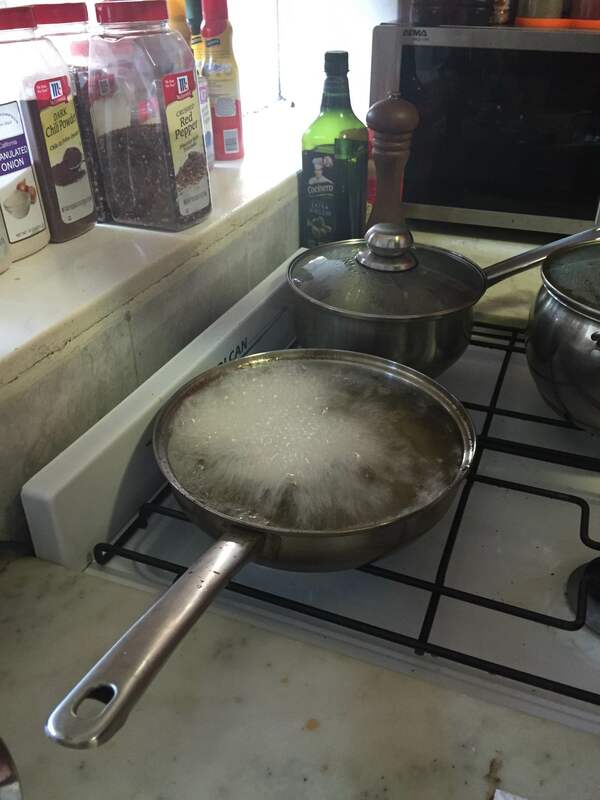 Then, get a pan full of oil (we use sunflower) nice and hot. 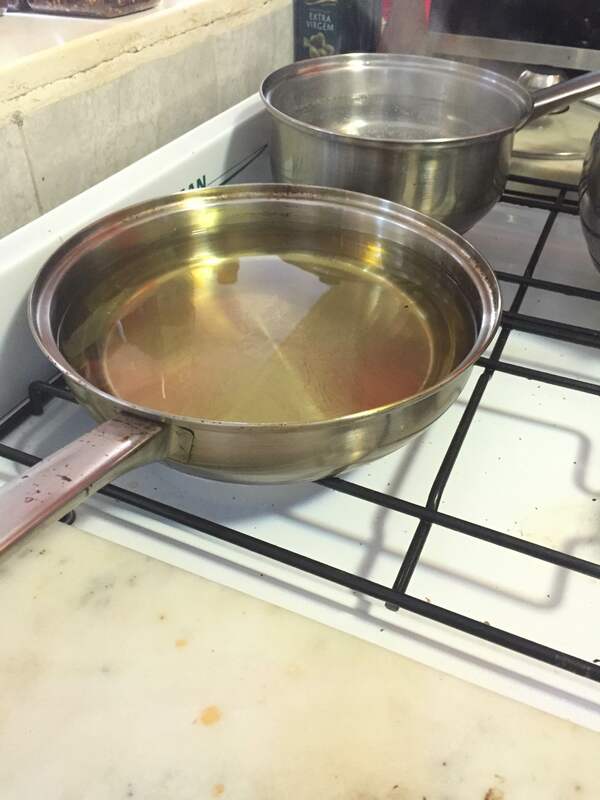 You should see the heat lines in the oil–wait until those dissipate, and then you know the temperature is correct. After that, carefully place the milanesas one at a time into the hot oil . They’ll cook up extremely quickly–in under two minutes! Remove with tongs. 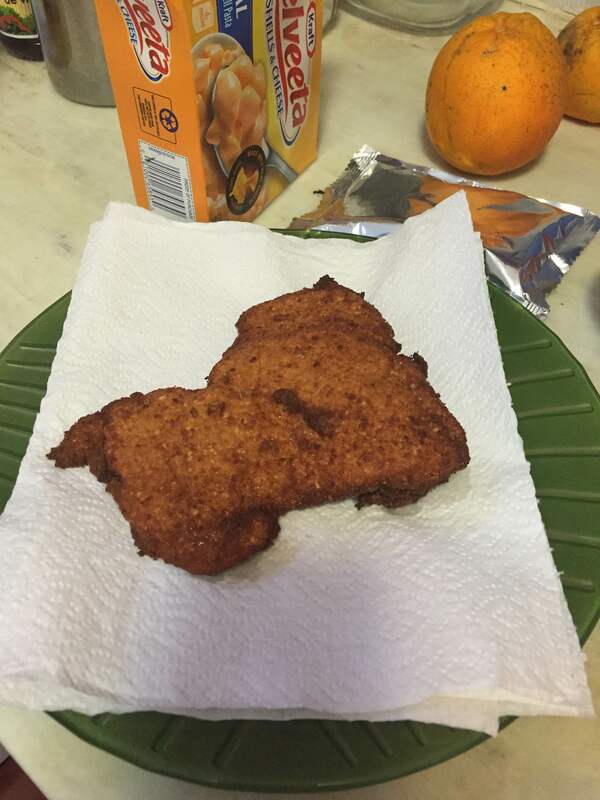 The final result will be a beautiful golden brown milanesa de pollo. Add your fixin’s from there! We’re incredibly American, so so we love barbecue sauce. Looking for a “real” recipe? Try this one by Argentinian spice giant Knorr (just put on your google autotranslate!). It’s finally Friday! We’re high-tailing it out of work early today, and taking Saturday and Sunday off to celebrate T’s birthday! I think this counts as our second full weekend off (excluding our trip back to the States in July) since we started here. Maybe our third. Regardless–it’s well-deserved. He doesn’t read the blog, so it won’t ruin the surprise when I say that we’re going to have a party/asado with the coworkers, drink some beers, and have some ice cream cake. We may even be able to talk him into going to the club! 1) To Work Better, Work Less feels entirely appropriate given the above statement–but it’s a sentiment I highly support. I’ve gotten to the point where I’m tired of pulling endless hours just to keep up appearances. Do your job, do it well, and do it in 40 hours. Give yourself the gift of a personal life. 2) A Salmon Cannon helps get fish over the biggest dams in the Pacific Northwest. I think it sounds like a zany Monty Python weapon. Somewhere, there are bears planning a field trip to these dams for the flung food. 3) This is an excellent article from NPR about parenting styles around the world. I can definitely attest to the late bedtimes children have here! It’s not abnormal at all to have a toddler at a midnight party. I’m not sure I’m fully up to leaving a child outside of a store while I shop (Denmark), but I have definitely admired the independence children exhibit down here. 4) In light of the absolutely tragic events this week, here’s a 2013 Reddit AMA (Ask Me Anything) with Robin Williams that is pure gold from start to finish. The world lost one of its best. 5) The Smithsonian Libraries’ Tumblr is posting all sorts of wonderful GIFs of historical etchings, drawings, etc. 6) I love this infographic about the five levels of business attire from Business Insider. I hate when companies just say “business casual” because there are just so many geographical and generational variations–particularly for ladies! 7) Owls are weighed while wrapped up in little blankets like bird burritos. This made my day. This week is incredibly busy for T and I. We have a squadron of Americans in for a work conference, so we’ll be entertaining all week. Hoping to post some more substantial updates by Saturday!